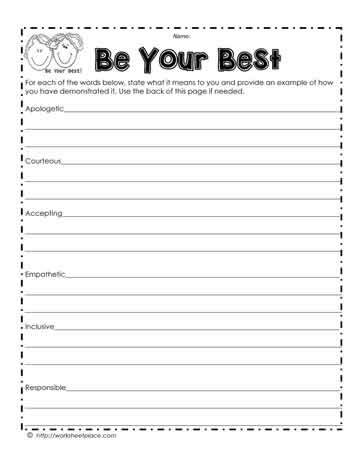 This character worksheet requires students to describe how they are apologetic, inclusive, empathetic, responsible, accepting, and courteous. When working with social skills and good character development, it is helpful to focus on a trait a month or even a trait a week. For instance, if responsibility is the chosen trait, begin with a brainstorm of everything it means to be responsible. Have students explain their strentghs and weaknesses with responsibility. Ask them to write goals to become more responsible. For each of the character traits, a similar focus can be taken.